Don Burr, head instructor with Northern Maine Community College's mechanized logging program, watches as student Will Shufelt practices using a delimber machine at a woodlot in Chapman, July 18, 2018. A pair of Maine lawmakers wants to get more of the state’s teenagers interested in logging. The lawmakers said their Future Loggers Careers Act would allow 16- and 17-year-olds to learn logging under parental supervision. They said that would allow the teenagers to contribute to family businesses, as well as help the businesses survive. 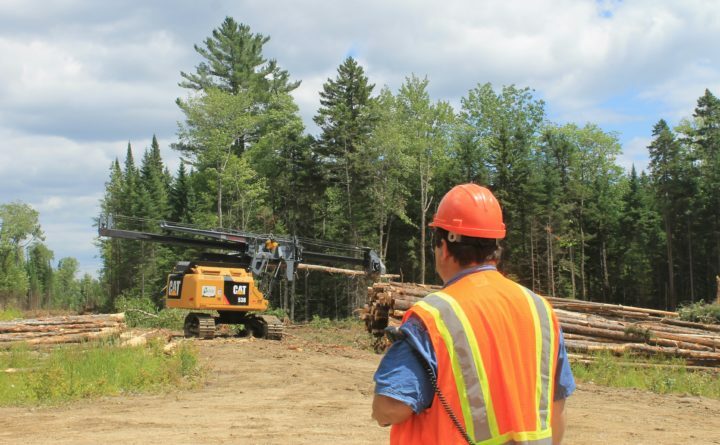 The group Professional Logging Contractors of Maine supports the legislation, which it said will help ensure a future generation of timber harvesters in the state. The bill includes safety provisions, including prohibiting manual chain saw use by minors. The bill is identical to legislation introduced by Rep. Bruce Poliquin and Republican Rep. Raul Labrador of Idaho. “Outdated regulations from Washington haven’t kept up, preventing young Mainers from pursuing careers in the trade in Maine, which largely consists of family-run businesses that have operated for generations in our state,” Poliquin said in a statement when he and Labrador reintroduced the bill in 2017. Poliquin said at the time that the bill would give young Mainers an opening into the industry and maintain logging jobs in Maine for years to come.